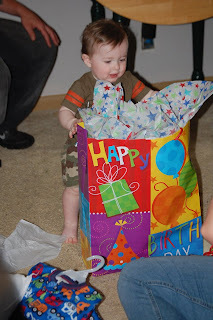 My youngest grandson Braden turned one year old on September 20. He was a bit excited! But, I hope that one day when I am gone, my grandson's can look back and remember the special cakes I made for just them on their b-day! Icing between each layer and stacked on top of each other to make it high so it would favor a block. This is Mommy ligthing the candle in hopes of Braden blowing it out... that did not happen. That out of the way, I want to say that I love fall. Today has turned off cooler and the leaves are just now getting a hint of color change to them. But another reason I love the fall time is that it produces the most prettiest sunrises and sunsets. On my trips to work this week I viewed two really pretty ones that I would like to share. This one was taken on Wed. Beautiful!!! Not as pretty as the day before but it was nice. 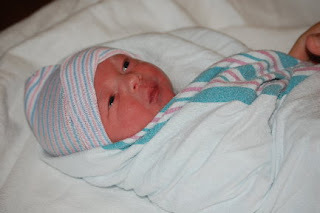 Braden ~ Born September 20, 2010. My youngest grandson is turning 1 yr. old. These are just a few shots through is his young life. 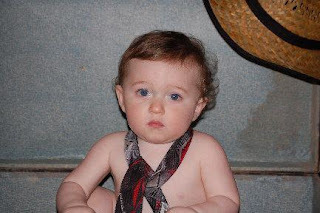 This next shot is of him on his 1st Halloween. Nana loves to pose him for pics. I love this shot. His Mom was giving him a bath in the sink. Look at that look of love of his face. Yes, that's Braden and his Nana (me) on his first time to stay the night with me. So much fun getting this shot. This is in Vanderbilt hospital when Braden had to have surgery. All was well and he did fine. Of course this shot was before surgery. Trying to check out Dakota. This is when he learned to pull up and walk around the furniture. Braden stayed one day with me and we got these shots. I love this one. Not looking to happy to have Nana taking his pics today. This shot was just taken last Suday. His hair has really grown and curled up. Gotta love that face and those cheeks. He was born in March, early and weight in a little over 4 lbs....and look at him now! Beautiful baby boy. I kept this little guy last weekend and I loved it. He is so sweet. And of course I took the camera... He played so well. But we had to try out all the toys! Reminded me so much of when I use to keep his Daddy.....it was like loving on Chase all over again. Love you baby Cole and when you get a bit older boy do I have stories about you dad I will share with you! Playing around with a Nikon D3100 and I love it... but I am still thinking that I will take it up one more step to the D5100 as my up grade. And hanging off the eve of my porch I found this guy. Now let me say first that I did not get to close because my biggest fear is a spider. But I have to admit the webs are a work of art....check this one out. 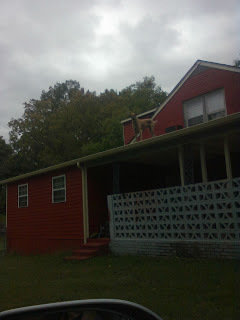 You have to look close cause he sort of blends in.....yes, that is a dog on the roof! Caught this the other day near work... the neighbor says he just comes out of the window, then goes back in that way. Sorry about the pic but was actually, which is rare, without a camera so I had to use the cell. Oh My Gosh....How Cute is He? I had my youngest grandson at the house a week or so ago while is Mom was working. So I had to get the camera out and play. My sis in law gave me a couple of old suitcases so I thought I would try Braden in one of them. I draped a tie around his neck and hung a hat on the corner. This is how that shot came out.... I had to take several of course while I had him still. I loved this one and I loved it more when I made it sepia to give it the aged look. While I was playing around with that one I decided to play with some other ones I had taken. I really did not care for this shot until I put the sepia to it but it was even cuter as a print. I love that look..that one eye peeking out from under the hat. I might be his Nana but I think he is just plain adorable!